Uncharted is probably the reason why I bought a Playstation. I remember being mesmerised by the world in Uncharted as I trekked through the jungle looking for a way out. To me, this is the most immersive game in terms of plot, direction and character development. I'm looking at the artbook for the final game and I've not played the game yet. But all those emotional feelings I felt while playing the earlier games are coming back to me. It's like coming out of the cinema after a wonderful movie and the mind is still playing back the scenes. As I looked through the pages of art, I could feel that this last game is going to be an emotional ride. This 176-page hardcover artbook is published by Dark Horse. Collected within are the development art for the game arranged in chronological order. The artworks are a mix of character designs and environment art. There are a lot of characters throughout the game and you'll get the see Nathan, Sully and Elena in various different clothes, and also the many other characters and enemies. The environment artworks are breathtaking as usual. Every one is good enough to printed out huge and hanged on the wall. I just love the design of the places, towns, Madagascar, Scotland, tropical forests, cove, beaches and underwater. I can see where the artists get their inspiration from, such as the huge stone faces in the middle of the jungle. Those are clearly from the famous stone faces at the Bayon temples in Cambodia. As a gamer, to be able to visit such beautiful places from the comfort of your seat at home is just amazing. For concept artists who want to study how good concept art looks like, you'll get a lot of good reference in this book. I guess the downside is the lack of commentary to accompany the artworks. However, there's a lengthy introduction included right at the front that gives us a recap on how the story and characters have evolved since the first game. This is an excellent companion art book for the fans. To me, it's like looking at a photo book after coming back from a wonderful holiday trip. Many years later when you look back at this book again, it will bring back fond memories. That's what a good story does. Kudos to all those who've worked on this game. 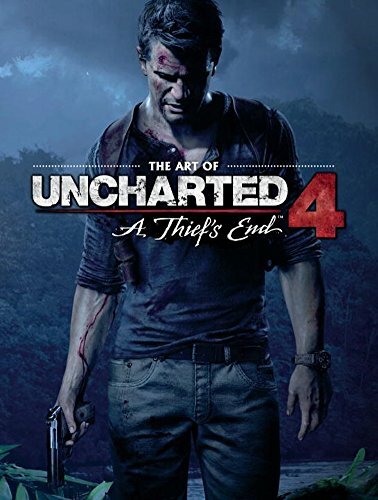 Be sure to check out all the other Uncharted artbooks too.